The 2018 World Cancer Leaders' Summit took place on Monday 1 October at the Grand Hyatt of Kuala Lumpur, in conjunction with the 2018 World Cancer Congress. It was preceded by the Summit Dinner, on the evening of the 30th. Entitled ‘Cancer Treatment for All', the annual high-level policy forum was hosted by the National Cancer Society of Malaysia (NCSM). 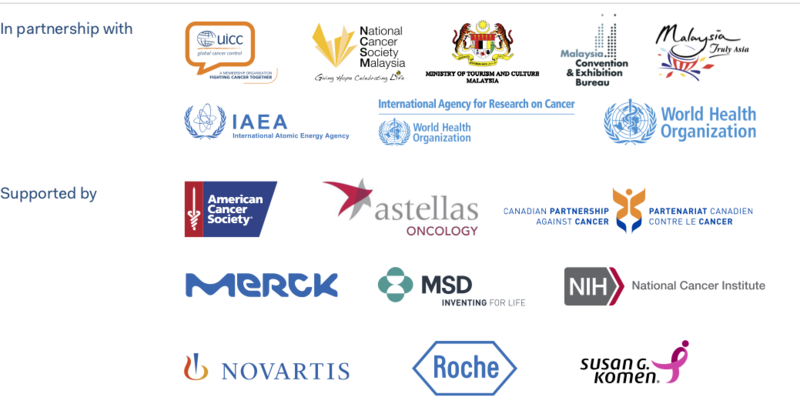 350 global leaders and influencers in cancer control and public health (from across governments, UN agencies, academia, the non-profit and private sectors) joined forces to issue an urgent call to countries to increase access to, and investment in, cancer services for improved early detection, treatment and care, in order to contribute to the 25x25 NCD targets. The Summit is mainly open to UICC members and partners and is a by invite only event. The International Agency for Research on Cancer (IARC) has been working with partners to improve cancer control through the Global Cancer Initiative on Cancer Registry Development (GICR). As part of these efforts, a series of six IARC Regional Hubs serve to strengthen in-country capacity for cancer surveillance. The Workshop will build on previous discussions to explore options for the launch of the IARC Pacific Islands Hub. Funding has been provided by Cancer Council Australia. The current landscape in Europe., The story so far ! The ABC Guidelines highlight the need for sensitive and honest communication with patients and families, and the need for oncology professionals to undergo training in this area. “Breaking bad news” is a regular task for oncologists, and patients may react with a variety of emotional responses, including anxiety, distress, anger and disbelief. Flexibility is required in responding appropriately to these emotions and paving the way for treatment discussions in a collaborative manner. Using the example of a relapse of breast cancer in a young woman, where optimal therapies are likely to add a financial burden to the bad news, participants in this interactive workshop will view video triggers and interact with a skilled communication training facilitator. For advocates there will be an opportunity to brainstorm how these conversations might best be undertaken in their cultural context, and to coach the clinicians to improve delivery. Tools to empower women in different environments to ask about new therapies will be discussed. Almost all Conference Sessions have better outcomes if participants are activated. The word says it: they are participants and should not be a passive audience. Another word for those participants’ state of mind is engagement. In this session, Congress Session' Chairs have the opportunity to work on ways to engage their session’s participants. UICC’s Chief Networking Officer Mike van der Vijver will share his insights on facilitation, moderation and content analysis in a fast-paced and interactive Master Class. Suitable for both new and seasoned presenters because the solutions will be based on presenters needs! Join us for another fun Welcome Reception in the Global Village. Our Global Village international exhibitors also look forward to welcoming you to Kuala Lumpur. The Opening Gala Dinner promises to be a fabulous Congress preview, topped-off with a stunning culinary experience and dinner programme. This stunning event will be hosted by the National Cancer Society of Malaysia, and is on invitation only.